Featured / Recipes / 09.09.2017. Even though it is unjustifiably neglected nowadays, buckwheat is a cereal mostly used in dishes of Međimurje and Podravina. 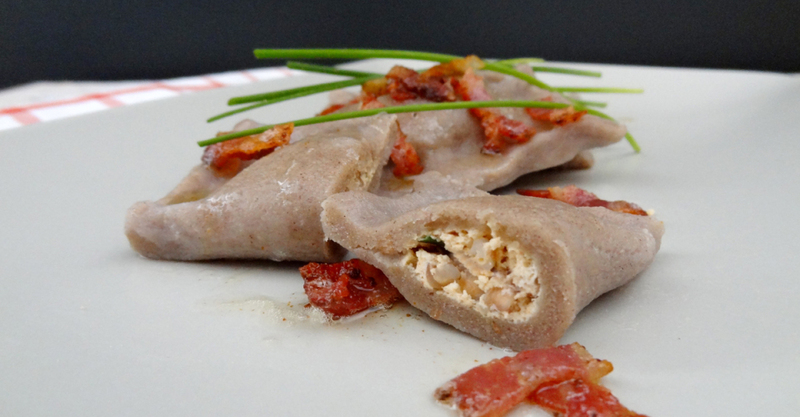 In this recipe, buckwheat pastry is filled with an interesting filling made of cheese, buckwheat, pepper and chives into dark pillows. When cooked, they are incorporated in a complete meal with baked bacon or without meat, with breadcrumbs on butter. Place buckwheat flour in a deeper bowl. Pour with boiling, salted water and mix with an electric mixer or wooden spoon until you get smooth pastry. Remove onto a floured surface and let cool for a while. Meanwhile prepare the filling. Cook the buckwheat seeds in milk, for about 10 minutes, until it is half cooked. Cool for a while. Separate yolks from egg-whites. Press curd cheese, add yolks, salt, smoked paprika and half a sprig of chopped chives. Then add buckwheat and mix it all together well. In the end add whipped egg-whites. Knead the pastry, adding it with rough flour, until it stops gluing to your fingers. Roll it thinly (3 mm/0,1 in) and cut in squares 8×8 cm/3×3 in. Place a teaspoon of filling to each square and fold the pastry. Press the pastry around the filling with your fingers, and form pillows on the edges. Put them in boiling salted water and cook for 10 minutes. Roll the cooked pillows in breadcrumbs toasted on melted butter or pour them over with thinly chopped and toasted bacon on butter. Sprinkle with remaining chopped chives.